Students walk near Sather Tower on the University of California at Berkeley campus February 24, 2005 in Berkeley, California. A newly-formed nonprofit purportedly serving Asian Americans and a professor who studies affirmative action are suing the University of California (UC) for access to data that they say could show whether the university system illegally discriminates against Asian Americans in admissions, NBC News reported. A spokesperson for the UC Office of the President refuted the allegations that the school system was not complying with the records law and illegally considered race in admissions. 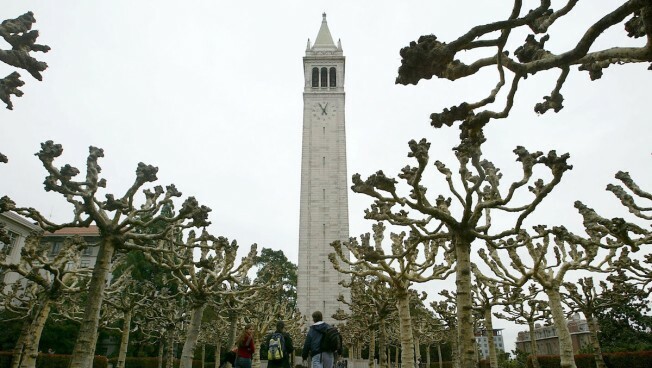 “UC does not consider race, ethnicity or gender in admissions decisions, or any other decisions,” Dianne Klein, press secretary for the UC Office of the President, wrote. Additionally, Klein said an allegation that the university is illegally denying one of the petitioners access to information is untrue.